Fairfax County police are trying to identify three men who have been using skimming devices at ATMs to gain access to bank customers' accounts. 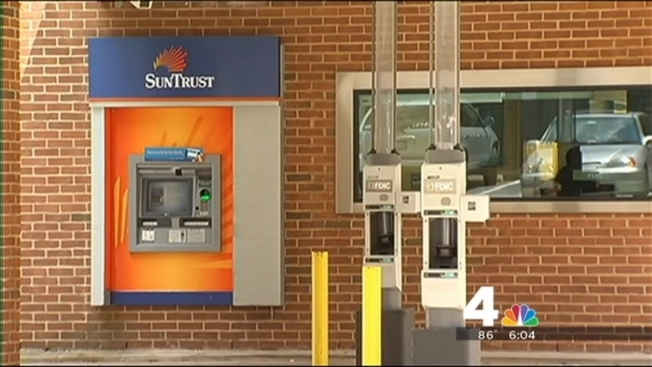 Police learned of the scheme after bank security personnel noticed men placing skimming devices on a drive-through ATM at the SunTrust Bank at 6052 Burke Commons Road in Burke on July 6. But their easy money may dry up soon -- because police have shared photos of the suspects. One of the suspects was captured on video while wearing a surgical mask. Police think he was adjusting a skimming device he recently set up at an ATM. Police say the men have used skimming devices at least four times since early June at three different SunTrust banks in Fairfax County. "While this particular series is linked to the SunTrust, there may well be other banking institutions that are being affected by this," said Lucy Caldwell of Fairfax County Police. The skimming devices, which are inserted into an ATM slot, are used to copy a bank card's identifying information. Small cameras are often setup to grab PINs. Thieves can then gain access to a customer's account. "These skimming devices are placed on many times with scotch tape and you can jiggle them and [have them] come right off, but you have to be aware of that or you wouldn't be looking for it," Caldwell said. Fairfax County resident Dawn Cassidy knows all about skimming -- her bank card information was skimmed about a year ago. "We used it at a gas station, actually, to buy gas, and we had it swiped... Somebody tried to use in Florida two hours later," she said. Cassidy's husband happens to work for a credit card company, so he's warned her what to watch out for. "I kind of look around to see if there are any hidden cameras or holes," she said. "...I definitely look at the device where I'm going to slide my card." But the recent skimming spree won't change one man's habits. "Honestly I don't look.... If they get me, they get me," said Tarryck Hollins.